Our farmlands produce numerous varieties of cheeses from milk generated by cows which graze on open lands rich with wild greens. 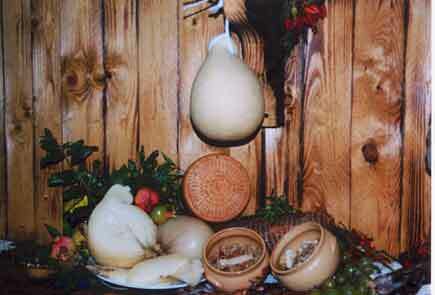 Caciocavallo, a rich, aromatic cheese, reveals the fragrances of the grazing lands where our cows roam. In the springtime this cheese reveals a rose colour due to the strawberries which the cows eat in the wildwoods. Ricotta made from lambs milk is oven-cooked to form a light, protective crust which seals in and enhances its sweet, aromatic flavor. 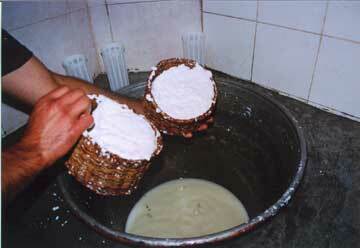 Pecorino, is produced from the milk of the unique Gentile sheep, utilizing goat curd.. The cheese is aged from 4 months to 2 years in cylindrical forms weighing between 2 and 7 kg., which are marked by the the baskets which are used to hold the curds. Its flavour is sweet, full-bodied and harmonious and has become one of Italy's most renowned cheeses utilized as a condiment over maccaroni.